Recent events involving law enforcement agencies have caused a lot of unrest in communities across the country. One of the solutions city officials and organizers have recommended is to document all police encounters using body-cameras. 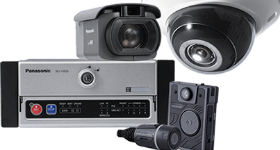 Panasonic’s next generation Arbitrator BWC (body-worn camera) and enhanced Unified Evidence Management System address those concerns. The complementary technologies give agencies a comprehensive solution that captures images, along with a management system that ensures the data is archived properly. "The new Arbitrator body-worn camera is set to become the next-generation standard in evidence collection for public safety professionals, featuring HD video; a compact, lightweight and rugged design; and seamless integration with the industry's best back-end video evidence management system," said Panasonic System Communications Co. of North America Vice President of Security Sales Greg Peratt. The Arbitrator BWC and enhanced Unified Evidence Management System work in tandem to provide an all-in-one solution. The Arbitrator captures video with 720p HD resolution and a 130° wide camera angle, digital image stabilization and low-light capabilities. The unit is designed to function under rugged conditions including rain, dust and other environmental conditions. It has a one touch recording and a built in GPS that automatically records metadata with location, time, date and officer ID. The battery life is also designed to provide enough power for a full shift and 12 hours stand-by to guarantee full support on the job. The Unified Evidence Management System is a platform that has multiple storage options of the recorded video from Arbitrator 360° in-car systems, body-worn and fixed surveillance, photos and other types of video evidence. The system simplifies the way videos are downloaded, stored and protected whether it is on premises, cloud, hybrid or other storage systems. It ensures chain of custody and the compliance requirements that have been put in place to prevent any tampering. The system is currently being piloted by several law enforcement agencies across the country.